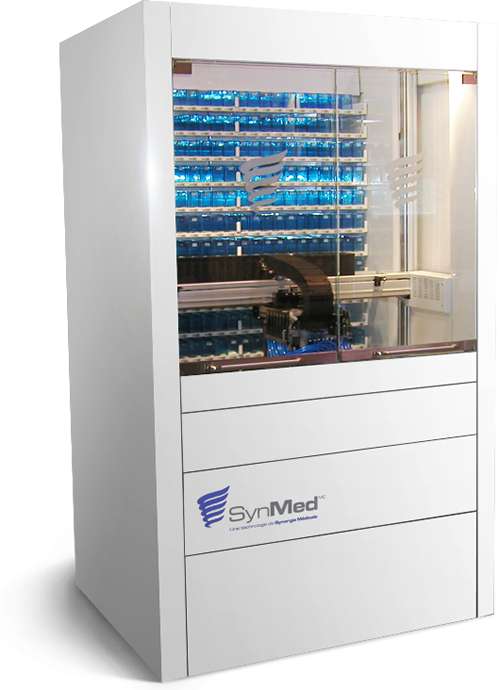 SynMed® is an automated system for preparing and dispensing solid oral medications in blister cards (pill organizers). SynMed® offers a complete range of functions that provide many competitive advantages. SynMed® is connected via an interface to the pharmacy’s management system and manages all the operations, from prescription reception to blister-card preparation. By simultaneously analyzing prescriptions for multiple patients, SynMed® establishes its work plan according to the selected medications and their position in the machine, and places them in the appropriate blisters. SynMed® eliminates the repetitive aspects of manual blister-card preparation and reduces control and verification time. Automated operation guarantees a continuous preparation process and decreases the issues due to external factors, such as fatigue and distraction, which can affect productivity and cause errors. The result is unparalleled precision combined with continuous production capacity at any time of the day. The printed information and visual markers on the blister cards simplify and accelerate verification. SynMed® consists of groups of cards on production trays and seven units that select and place the medications in the blisters simultaneously. SynMed® automatically manages the selection, counting and placement of medications in the blisters at a continuous rate of 55 doses per minute. Depending on the average number of medications per patient, up to 45 cards can be completed per hour by one operator. SynMed® automates blister-card preparation and enables the pharmacy to greatly increase safety. By integrating scanning and reference points at several production and verification stages, SynMed® ensures simple and thorough control. The medications are automatically selected, counted and placed in the blisters, while the pharmacy’s management system sends the prescriptions to the robot electronically. The resulting reliability is clearly superior to that of the manual preparation method. SynMed® reduces preparation time by up to 80% compared to manual preparation, and verification time by up to 50%. Contact a Synergy Medical advisor for a copy of a financial impact analysis of pharmacies that have implemented SynMed® technology and for a personalized analysis. The coloured label on the blister card produced by SynMed® contains many practical reference elements for the patient and care provider. It also includes the patient’s photo and a picture of both sides of the tablet, which facilitates identification and simplifies the monitoring of changes in treatment. Each blister in the card contains a description of all the medications, a pictogram clearly indicating when the medication is to be taken and, if necessary, a colour photo of the resident for identification purposes. It has been shown that polymedicated patients who use blister cards indicating the dosing times and days take the proper dosages as prescribed 97% of the time compared to 61.2% for nonusers. The personalized cards with detachable blisters produced by SynMed® are easy to transport and help patients take their medications, whether at work, while traveling or during their leisure activities! Permits centralized production for several stores. A distinct bar code on every label ensures a secure link with each card prepared by the robot. The units have automatic access to all the containers in the store and the blister cards on the positioning tray. A detection sensor ensures unparalleled accuracy during preparation, respecting the prescription at all times. Multiple cards grouped on each tray ensure unparalleled productivity. Easy access to the SynMed® store for replenishing the containers. Between 336 and 572 different oral medications, depending on the configuration chosen. Manages inventory, lot numbers and expiry dates. Unparalleled speed and reliability compared to manual preparation. Leave us your contact information and we will contact you directly.